With an inventory that includes plasma cutters, truck boxes, pet care products and rainwear, the Tractor Supply Company is a store where there is something for everybody. Exclusives at the company include the Riderless Pony Express Horse. The Tractor Supply Company's customer service is praised by consumers calling it "a store you can trust". Tractor Supply Company : No coupon code needed. Tap to shop the sale now. Tractor Supply Company : Tap offer to copy the coupon code. Remember to paste code when you check out. Online only. Tractor Supply Company : Merry Christmas! Get 5% – 20% Off Sitewide. Tractor Supply Company : Get Free Shipping on American Farmworks Fencing. Fencers Ship for Free Everyday – Online Only! Buy Online and Pick Up in Stores. $40 Off Reese TowPower 92 in. Aluminum Ramp Arch Center Fold, 1500 lb. 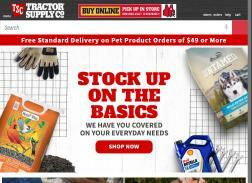 Tractor Supply Company : Get $10 off your order. Expires on 07/11/2014. Tractor Supply Company : Take 10% off entire purchase. Expires on 03/02/2014.